Readers of this blog know that I take a non-conventional approach to gut health. While I feel that focusing on what goes in to the gut is important for gut health, it’s not the only kid on the block. Over the last few blogs I’ve discussed how factors in the blood play a big role in regulating how an organ, whether it be the gut or liver, functions. One of the biggest ways that our blood can help promote healthy organ function is by maintaining a large local stem cell pool. As we age, and the stem cell pools in each of our organs/tissues declines, we begin to see a sharp decline in the function of many of our organs, the gut included. Interestingly, when we infuse older mice with the blood of younger mice, they show improvements in organ function. This process is now being studied in humans. Part of this is regulated by factors in young blood that rejuvenate the stem cell pool of older mice, the rest is probably a dilution of factors in old blood that do the opposite. This has led researchers on a feverish attempt to identify factors in young blood that may be used beneficially to reverse aging in older animals. Recent work has identified the hypothalamus as a regulator of the aging process(1). In this study, researchers observed that mice lose stem cells in the hypothalamus as they age. When young mice had these stem cells depleted, they aged at a faster rate. Looking at older mice, injecting hypothalamic stem cells into older mice rejuvenated them, causing them to function as if they were younger. The researchers identified that these stem cells were doing more than just replenishing cells in the hypothalamus. In fact, they secrete messenger molecules called microRNAs that travel throughout the body and help regulate aging remotely. Even in the absence of an increase in stem cells, infusing these microRNAs gave older mice more youthful function. MicroRNAs regulate gene expression, usually by reducing it. In the hypothalamus, these microRNAs are packaged in to transport vessicles called exosomes. 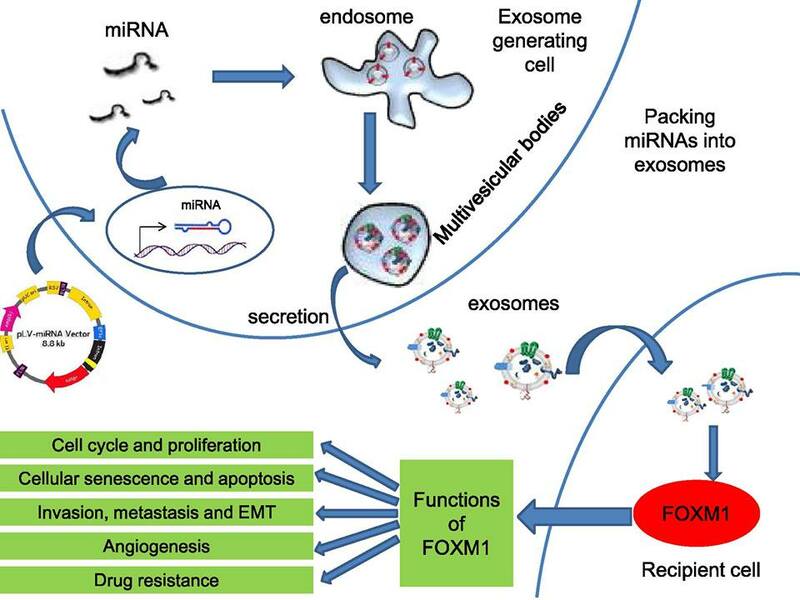 Stem cells secrete these exosomes and they enter the circulation to regulate gene expression in remote tissues. Given that the hypothalamus is the control center of the body, it makes sense that it would play a role in regulating the aging process. But it gets even more interesting than that. There are many factors that regulate the number of stem cells you have in any given stem cell pool. One big factor is cellular senescence, something I’ve mentioned previously. When stem cells enter senescence, they no longer replicate and therefore can’t contribute to replenishing cells as they die. They also secrete factors such as inflammatory cytokines that can have detrimental effects on other stem cells in the local stem cell pool. Cellular senescence isn’t a one-trick pony, there are many factors that can lead to cellular senescence. One factor that appears to be partially under our control is the level of the oxidized form of nicotinamide adenine dinucleotide, called NAD+. NAD+ is a coenzyme found inside cells that helps generate energy for cellular processes. As a coenzyme, it exists in 2 forms: an oxidized form(NAD+) and a reduced form(NADH). NAD+ and NADH levels are coupled together such that the total pool of both is pretty consistent, but the ratio between NAD+ and NADH changes depending on what’s going on in the cell. This ratio is very important with regard to cellular senescence. When we process glucose in the cytoplasm of our cells, this reduces NAD+ to NADH. The NADH then powers other processes and hopefully becomes NAD+ again. 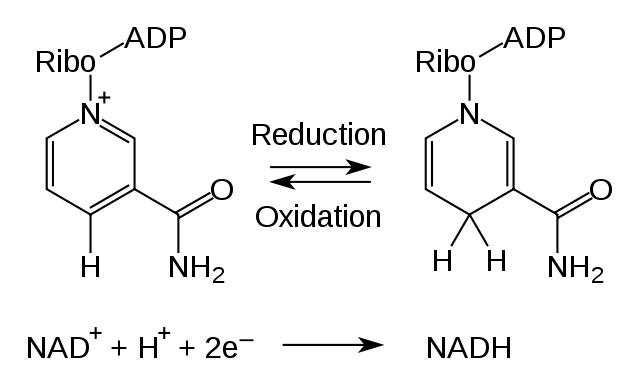 Having a lower NAD+/NADH ratio can be problematic because 2 very important pathways to cell health utilize the oxidized from(NAD+), but not the reduced form(NADH). These 2 pathways, the sirtuin and Poly(ADP-ribose) polymerase-1(PARP-1) pathways, are important for fixing DNA damage and repairing other cellular components. When the NAD+/NADH ratio is lowered, this promotes cellular senescence. Increasing NAD+ rescues stem cells, including neural stem cells, from senescence(2, 3). Through the sirtuin and/or PARP-1 pathway, NAD+ may play a big role in regulating the stem cell pool in the hypothalamus. But it appears that part of this process may be occurring outside of the hypothalamus, via something you probably spend most of your time trying to get rid of: your body fat. The NAD World is a concept put forth in 2009 and recently updated in 2016 by Shin-ichiro Imai. It illustrates the importance of inter-tissue communication for controlling the aging process. The basics of the NAD+ world are pretty straightforward. In our cells, nutrient status is sensed by the sirtuin/NAD+/NAMPT axis. When we are in a fasted state, the NAD+/NADH ratio is high which increases sirtuin activation and activates the circadian clock. 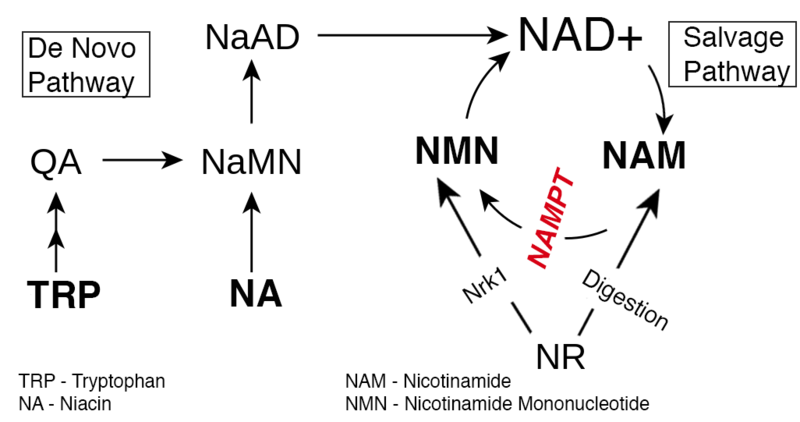 The circadian clock then increases activity of the enzyme nicotinamide phosphoribosyltransferase (NAMPT), the rate-limiting enzyme for NAD+ synthesis. Sirtuins are NAD+-dependent enzymes, so this effectively allows the sirtuin train to keep pumping along by supplying NAD+. 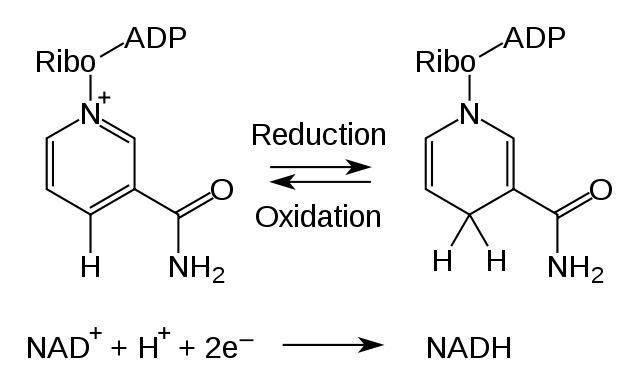 This pathway is referred to as the salvage pathway of NAD+ synthesis and is essential in humans. The salvage pathway is important because when sirtuins utilize NAD+, they make nicotinamide(NAM), which inhibits sirtuin activity. In addition to local cellular NAD+ synthesis, there’s a remote pool of NAD+ that’s also predominantly driven by fasting. As we enter a fasted state, sirtuin 1 is activated in our fat cells. This causes them to release a special form of NAMPT called extracellular NAMPT, or eNAMPT. While we don’t know the particulars of how this raises NAD+ levels remotely, we know it does. Knocking out NAMPT in the fat cells of mice causes a drop in systemic eNAMPT AND NAD+ in the hypothalamus but not the liver, muscle, or hippocampus(4). That’s right, the level of NAD+ in the hypothalamus is dependent on circulating eNAMPT, which comes from fat. The theory behind the NAD World is that there are frailty points in the body that require adequate levels of systemic NAD+ due to low local NAMPT activity. NAD+ for these tissues is partially supplied by eNAMPT secreted by fat tissue during fasting. Two of these frailty points are the hypothalamus and pancreas. When NAD+ levels drop, as they naturally do in aging, sirtuin activity cannot proceed in these tissues and crucial repair processes go unperformed(5). This may lead to organ dysfunction basically anywhere because the hypothalamus is the control center of the body. It may also promote senescence. Neural stem cells are dependent on adequate NAD+ for both self-renewal and differentiation(6). Based on the evidence above, neural stem cells in the hypothalamus are dependent on systemic NAD+ to provide an adequate supply. But as we age, our NAD+ levels naturally decline. This is through a variety of reasons, but a recent study found that one of the primary drivers of decreased NAD+ with age is an increase in CD38 activity(7). CD38 is a protein found on the cell surface of many cells of the immune system and increases with age. CD38 breaks down NAD+ and the NAD+ precursor nicotinamide mononucleotide(NMN), which is made by NAMPT and eNAMPT. Since aging increases tissue CD38 expression, this reduces NAD+ availability for stem cells in the hypothalamus. Furthermore, when CD38 utilizes NMN, it converts it to NAM, which inhibits sirtuin activity and requires NAMPT for conversion back to NMN. There are a couple of states that can replete the NAD+ pool. Both fasting and the ketogenic diet increase the NAD+/NADH ratio. In the hypothalamus, this has the added benefit of reducing inflammation, which attracts CD38 expressing cells to the area. In fact, the ketogenic diet decreases inflammation in the hypothalamus via a mechanism that requires an increased NAD+/NADH ratio(8). Supplementing nicotinamide riboside has also been shown to increase cellular NAD+ levels in humans(9). I’ll be quick to point out that I don’t believe simply supplementing with nicotinamide riboside is an effective strategy for mimicking fasting or the ketogenic diet. Fasting does a lot more than change the NAD+/NADH ratio and also has an impact on other longevity pathways that don’t directly involve NAD+. Having said that, if you’re over 40, supplementing with NAD+ precursors such as nicotinamide riboside or nicotinamide mononucleotide may be a wise idea..
A final approach, and one that can be used in combination with the 2 approaches above, is to inhibit CD38. There are a few substances that do this, including apigenin, quercetin, and fisetin(10). These polyphenols have a long safety track record so the only concern would be adequate bioavailability. Although still just a hypothesis, evidence is piling up in support for the NAD World. The basic premise, that NAD+ availability in remote tissues is dependent on release of eNAMPT from fat tissue during fasting, weaves together the importance fasting plays in aging and age-related decline. This is of particular relevance to people in the developed world because we don’t spend a lot of time in a fasted state. Tissues such as the hypothalamus and pancreas act as frailty points that “break” once NAD+ availability decreases to a certain threshold. This may be due to a multitude of factors including a decrease in the local stem cell pool. Given that recent evidence indicates that aging is regulated, at least to some extent, by microRNAs secreted by stem cells in the hypothalamus, the consequences of this could lead to an increased rate of aging and age-related decline. A primary driver of the decline in NAD+ that comes with age is a 2-3x increased expression of CD38 in tissues throughout the body. CD38 is highly expressed in cells of the immune system, and inflammation increases CD38 expression. 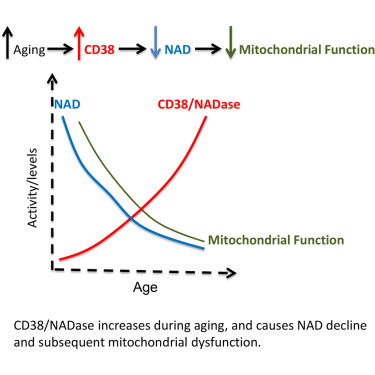 This may be the primary mechanism by which the chronic low grade inflammation associated with aging drives the age-related decline in NAD+ levels. Adding to the relevance of the NAD World, CD38 activity is increased 2.5 fold in human adipose tissue. Overall, the NAD World provides a nice framework by which fasting promotes healthy aging. Research is currently under way to better understand the NAD World and how inter-tissue communication helps to regulate the aging process. In my next blog I’ll uncover the relevance of the NAD World to the gut. Are you a circadian night owl? Should you resist or embrace it? How long of a fast is necessary to begin to raise NAD+ levels? How long of a fast is necessary to reach the maximum benefit level for increasing NAD+ levels?